Identification: Antennal knobs are black and white. Upperside is dark brown; forewing with pale orange postmedian band and orange submarginal band. Underside of forewing is yellow; black patch on inner margin is larger than black patch near costa. Underside of hindwing is yellow-tan with faint markings; female with black submarginal dots. Life history: Females lay eggs in groups under host plant leaves. Caterpillars eat leaves; first- and second-stage caterpillars live together in webs on the host plant. Third-stage caterpillars hibernate. Flight: One brood from May-July; sometimes a partial second brood in Michigan. Caterpillar hosts: Wavy-leaved aster (Aster undulatus) and perhaps other true asters. Habitat: Moist meadows and pastures in the northern part of its range; dry rocky ridges or hillsides in the south. Range: Southwest Quebec west to central Alberta, south to north-central Montana, Wisconsin, Michigan, and northern Georgia. Isolated colonies in the Black Hills and Nebraska's Pine Ridge. 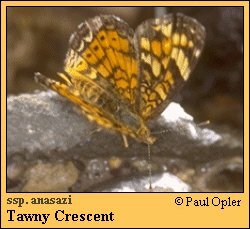 Conservation: For unknown reasons, this butterfly has disappeared from most of its eastern range.